In fewer than fifty years video games have become one of the most popular forms of entertainment, but which are the best games, the ones you must play? 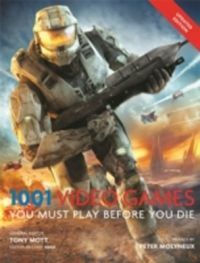 Video game expert Tony Mott presents 1001 of the best video games from around the world and on all formats, from primitive pioneering consoles like Atari's VCS to modern-day home entertainment platforms such as Sony's PlayStation 3. Each entry includes an illustrated screenshot of the game in action, along with details of its original release date and platform, with informative and authoritative text outlining its play mechanics, artistic qualities, contributions to its respective genre, and more. From Donkey Kong to Doom, and from Frogger to Final Fantasy, 1001 Video Games You Must Play Before You Die is the essential guide to everything from the old favorites to those breaking new ground. These are the games that should not be missed.